Baltic Deal Bridge projektet är ett fortsatt nätverksbyggande mellan länderna som samarbetade i projektet Baltic Deal, med syfte ett renare Östersjön. Within the three-year Baltic Deal project with participants from seven countries, 120 demonstration farms were established. There was a network of farms within the countries and also farms in different countries. This report studies the need and advantage of demonstration farms and what can be learned from them. 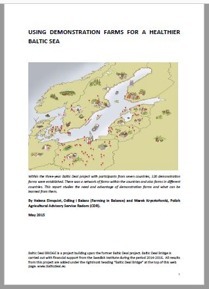 A final report has been produced within the Baltic Deal project.  Demonstration farms are an important and appreciated tool to increase knowledge transfer between farmers and increase the rate of implantation of new ideas among farmers.  Combined political powers and measures in all countries around the Baltic Sea are needed to improve the situation in the Baltic Sea.  Baltic Deal and the Baltic Deal Bridge farm network fulfil an important function in bringing about change. The demonstration farms are used to spread knowledge and show the practical measures implemented. They inspire other farmers to carry out measures that decrease the load on the Baltic Sea. The collaboration and networking between the countries has been very positive. Exchange of knowledge leads to change.  The demonstration farms are also used to test new solutions and several are participating in research and development projects.  Demonstration farms need to be chosen carefully in order to show good practice and generally act as a good example. They should also represent different production specialisations and be available at different sites in the countries around the Baltic Sea.  For the work with demonstration farms to fully succeed, good collaboration is needed between farmers, advisors and researchers.  The network makes farmers aware that everyone must play their part. It is a great educational benefit to see and hear that other farmers are taking action. In a survey, almost everyone believed that ‘other countries’ release more pollutants. Farmers need to feel that they are not alone in their struggle to improve the environment The aim is to present the project results, possibilities and future plans in a brief and concise format. Using demonstration farms for a healthier Baltic Sea, Author, Helena Elmquist, Odling i Balans (Farming in Balance) and Marek Krysztoforski, Polish Agricultural Advisory Service Radom (CDR).